From 31st March for 2 weeks artists from as far away as Brazil converged on Cambridge to debate, discuss and imagine ways of responding to the environmental challenges facing our planet. This is the 2nd Cambridge Sustainability Residency run by artists with support from Cambridge School of Art. The 14 selected artists encompass sculpture, moving image, photography and installation and this year include the curator Vanessa Saraceno from Italy and the award winning designer Andrea Bandoni from Brazil. 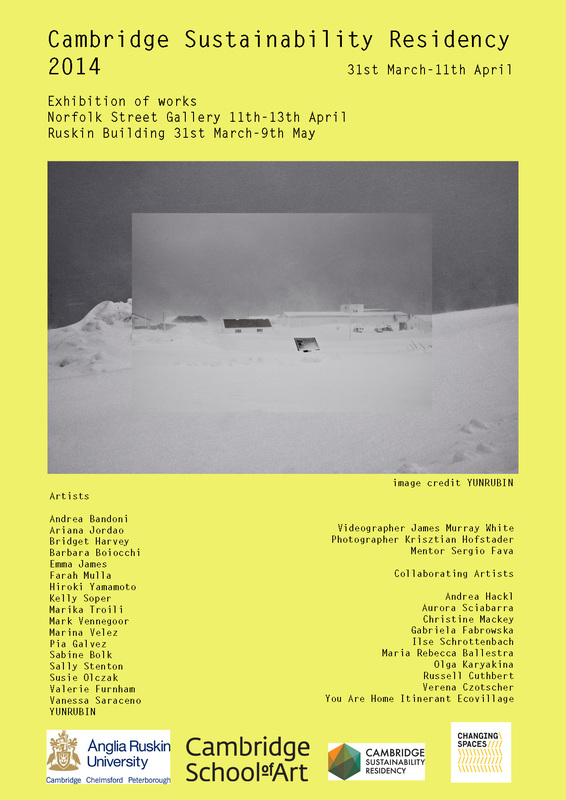 The organisers of the residency also wish to build up a network of artists interested in the field of sustainability, and in the spirit of establishing a continuity and to foster relationships they have invited some artists who participated in the first residency to exhibit work alongside the selected artists from 2014 residency. The 2 weeks culminated in an exhibition at the Changing Spaces Gallery on Norfolk Street from 11th to 13th April with the Private View on 10th April from 6 to 8pm.